The Deoni breed of cattle also sometimes known as Dongari (which means "of the hills"), has been evolved within the last 200 years. It is claimed that it has been developed from a strain descended from the mixture of Gir, Dangi and local cattle. A contribution from the Gir type of cattle is quite evident in the formation of the head and ears, and also of the horns to a certain extent. They also show a great similarity in general conformation and ruggedness to the Dangi cattle of Bombay State, an area which is not far from the Deoni cattle breeding area. The Deoni is a medium-sized animal which resembles the Gir in physical structure to a large extent. The body color is usually spotted black and white. The face is also similarly patchy and spotted with black and white. The forehead is convex and bulging, though breeders have not paid the same scrupulous attention to this trait as the breeders of Gir cattle, and though the ears are long and open forward they lack the leaflike structure and also the notch at the tip of the ear that is typical of the Gir. The horns in typical animals take a characteristic outward and backward curve similar to that generally to be seen in Gir cattle. The skin is loose and of medium thickness. The dewlap is heavy and the sheath is usually pendulous. The hair is soft and short. The cows have a fairly well-developed udder. The body is massive and upstanding with considerable depth. The hooves are well-made and shapely and of a black color. The body structure gives appearance of strength. Joshi, N.R., Phillips, R.W. 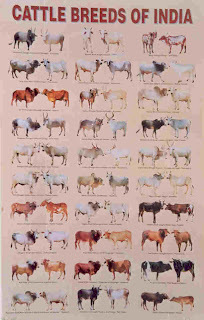 (1953) Zebu Cattle of India and Pakistan, FAO Agriculture Studies No. 19, Publ. by FAO, Rome, 256 pp.